Usually delivered within 2-4 days. The Atik 4120EX is the highest resolution camera from the 4-series, and the highest resolution Atik Camera to date. Featuring the latest generation Sony EXview HAD CCD II technology, this camera has an outstanding Quantum Efficiency, very low noise and excellent thermal management. This model is an ideal match for Hyperstar systems, where fast f/2 imaging makes it easier than ever to get good results, but can also be used with short focal length refractors and astrographs, for beautiful, wide field views of the night sky. The high resolution is very apparent when printing images out to A3 poster size and beyond and really makes a striking visual impact. This also provides the option of zooming into different parts of an image on a computer screen to see the extra detail pop out. The Atik 4120EX is only available as a one shot colour camera (OSC) as this is the format in which the small pixel size really has an advantage in faithfully recording the colour of the stars and nebulae in the image. OSC cameras allow to take a single image and see the color, something that would require filters and a filter wheel to accomplish with a monochrome camera. 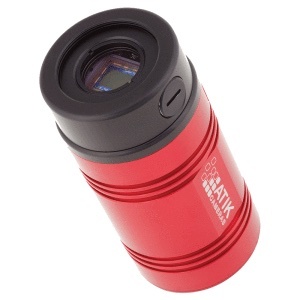 Adding a simple InfraRed block filter or a light pollution filter is all you need to explore the wonders of the universe with the Atik 4120EX. The Atik 4120EX fully supports 1.25" filters down to f/2, so helping to keep costs down compared to the larger filter types. The other advantage of a OSC camera is the simplicity of processing its images. By recording colour in one image you do not need to align the 3 or 4 separate images types required for LRGB or RGB imaging. The Atik-4 Series cameras are a development of the renowned 3-Series cameras, featuring better cooling and narrower body. They benefit from set point cooling to make taking matching dark frames a snap, and simple 12V power requirement to facilitate field operation. The impressive sensitivity, great cooling and narrow profile, make the Atik Series 4 outstanding CCD cameras to use on modern telescopes. Atik highly-acclaimed Capture software is included for camera control and data acquisition, and plug-ins are included to allow use with Astroart and Maxim DL.